At its second Elevate Summit in Los Angeles, Uber shed some light on plans to overcome key barriers to its vision of on-demand air mobility. Keen to own all aspects of a future based on on-demand urban mobility, Uber has set its sights on air transport as a complement to its automobile network and recently acquired last-mile electric scooter businesses. Basically, if you want to get anywhere in an urban environment, Uber wants to be your one stop shop. The major takeaway was that Uber is planning on partnerships to realise a lot of this vision - sensible given the stringent safety and performance requirements that will be necessary to roll out an aircraft ride-sharing network. Firstly, to the aircraft side. Exciting high profile EVTOL concept reveals were done by sizeable players such as Embraer and Karem Aircraft, joining more than 70 development partners working with Uber. The company has taken a page from NASA’s playbook by developing common reference models for the vehicles it requires which gives partners the ability to go away and innovate but with the key requirements that the company is looking for in mind. Another part of the equation that will be solved by third parties will be places for air taxis to pick up and drop passengers - Skyports. 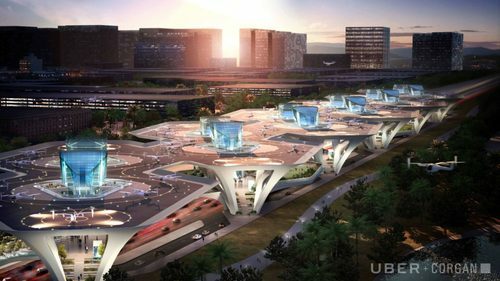 Gannet Fleming and Corgan unveiled futuristic skyport concepts that will be able to meet Uber’s stated requirements of 4000 passengers per hour within a three acre footprint. The designs look fantastic but they are very much concepts - there are no financial feasibility considerations just yet. A key bit of the jigsaw that Uber will handle closer to home is air traffic control. For the aforementioned skyports to handle sizeable volumes in urban locations, a whole new approach to air traffic control will have to be developed. Uber calls its approach Dynamic Skylane Networks - similar to a virtual series of roads in the sky - where the skylanes will actually adjust depending on where the traffic needs to be routed. However, Uber won’t seek to own or control such a system but rather attempt to make it an open standard for others to use too. The FAA and NASA and working closely with the transportation specialist to help develop the concept. In the age of the internet, he who owns customer demand is king. Despite recent stumbles, air taxis are another piece of the puzzle that may allow Uber to continue its stranglehold on the end user and extend its lead in ride-hailing, thought to be one of the next great markets.